Flexibility and The "Hard Right-Hand Side"
Regardless of Elliott Wave counts in the past, traders often say, "It's the Right Hand Side of the Chart that's the Hardest". This is true, and we'd like to clearly demonstrate why some flexibility is needed in Elliott Wave Counting, especially near a top. 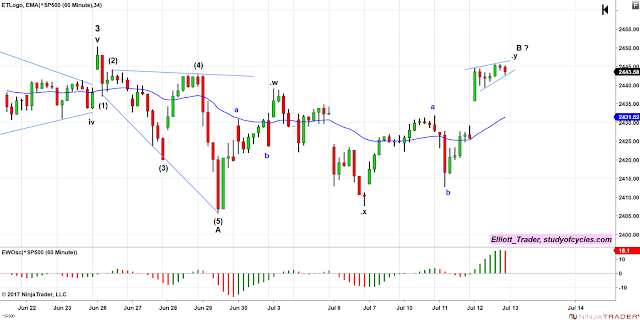 First, this chart is in reference to the down move to 2460, on 27 July, shown below in one count in the S&P500 Cash 15-Mminute chart, below. After, the downward move, we can STILL only count three-wave moves upward. Shown as blue. We said, it was entirely possible price was either making a triangle or a double-zigzag. And, with today's small gap up, then gap fill, we did invalidate a smaller B wave triangle, and clearly got the higher high needed for the y wave of a double zigzag upward. But still it did not hit the 78.6% Fibonacci retracement level. The three-wave structure is clearly shown with the blue .a and .b providing the interior waves. But then, as the day progressed, and prices hugged the unchanged line it seemed like a triangle might be forming - especially given the larger reversal candle as the last bar of the trading day. Now, we know tomorrow is the first day of a new month, and might have some inflows again from pension funds, company bonuses, dividend reinvestment plans, 401k's, etc., and so now one has to ask, "Is this another triangle for another x" wave, before a final z wave up on the new money, as shown above? Neely tends to indicate that purpose of such a triangle is so that the wave 2 precisely hits it's target at the 61.8% retrace level - which I find to be an extremely interesting and cogent observation. Prechter also allows second waves where the Y wave of the 2nd wave is a triangle. And the bright ones among you will even realize that since we don't know if downward movement is entirely over, couldn't the whole structure be an upwardly pointing triangle, as some sort of fourth wave?? And, the answer is, why, yes, it could! It's at time like these that any Elliott analyst who says they are "certain" of the next price movement is probably smoking locally grown products from Colorado. Or, they have exceptionally good market metrics - much better than what we can find. Yet, while it is often best to stand-aside from a definitive wave count and let it "shake out", that is precisely the actual benefit of Elliott Wave in real-time. You see - each of those potential triangles, whether pointing upward or downward, has clear points where they must invalidate from an Elliott Wave perspective. And that is exactly how the count becomes clearer, and leaves fewer and fewer options until there is only one. So, stay tuned, as we go into seasonally one of the more difficult months for the stock indexes. And have a very good start to your evening. Is weekly GOLD triangulating? We have to say up front that, while we don't know for sure, something sure seems odd. First, here is a chart of weekly GOLD with the outlines of a potential triangle. The upper trend line is dotted black to show that this trend line is not yet proven. When you look over this chart, you'll notice that the current wave from December, 2016 so far is taking more time than the minor A wave up. And, the weekly MACD, while barely positive, is still as flat as a pancake. That just doesn't seem like the way a strong C wave up starts. So, we have to ask the question, "are we in a weaker C wave, like that of a triangle?". The minor B wave down stopped just shy of the 78.6% Fibonacci retracement level, and that is a common turning point for triangle-type retracements. So, the potential dotted black trend line of a triangle is shown where a C wave of a symmetrical triangle would also retrace about 78.6%. Price is not there yet. Next we correctly counted the (a) wave up of C from the weekly chart, above, on a 4-hr chart of GOLD as a Leading Contracting Diagonal - which meant higher waves were to come, and they did. And we correctly called for a longer (b) wave lower - some or all of which did form. And now that prices have turned higher again. We thought we'd have a look at the latest 4-hr chart, using The Eight Fold Path Methodology, and Neely style counting. Here is that chart. There are some things to notice on this chart. First, all of the current price movement is confined to a channel. Second, if we look for ways not to chop off any part of a third wave with a line connecting the start and the second wave, this is about the only way to do it. Third, we note that while there certainly does appear to be a third wave, (iii) at the high point of the Elliott Wave Oscillator (EWO), then the waves that immediately precede it are intensely choppy. So, we think that area is better described as the "fifth" wave of the third wave, v, and not the middle of the third wave. That nice big impulse bar, iii, looks to be the middle of the third wave. Fifth, wave (iv) has a good fourth wave look to it, and alternates well with the second wave (ii). Six, because wave (ii) is more than a 38.2% retrace, we are probably not dealing with the situation where the first wave is the extended wave in the sequence. Seventh, the B wave retrace is only 23.6% which is OK for the shallow retrace of a zigzag - since we are likely not dealing with the extended first wave scenario. This is shown by the fact that the third wave is over 261.8% times the first wave, no matter how you measure it. And, Fibonacci eighth, notice that while price is diverging from the EWO already, there are only 87 candles on this chart - not the 120 - 160 recommended per The Eight Fold Path Method. And that means this wave is likely not forming a true impulse wave up. All of this suggests that GOLD may only be in a zigzag higher, and while the upward count is not finished, it may either point to a smaller potential interior triangle on the weekly chart, shown in dotted blue, or the larger overall potential triangle shown in black. As always, triangles are forms that must prove themselves in every detail. And, the best alternate for the potential triangle is the double combination (W-X-Y) where W = A, and X = B from the current weekly chart. Trading above 1,340 would tend to indicate that the double combination was the more likely scenario. 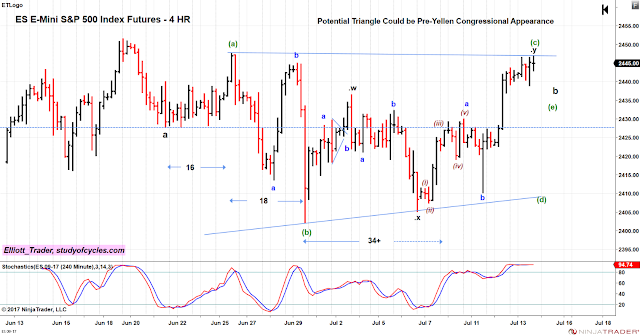 In this case, from the four-hour chart A would be 1, and B would be 2, and with the 23.6% pull-back only, then 1 would likely be the extended wave in the sequence. But, that's why this is the alternate case - because there was an initial deep enough pull-back for wave (ii) to allow the extended third wave (iii). In either case, the up wave does not appear to be quite finished. 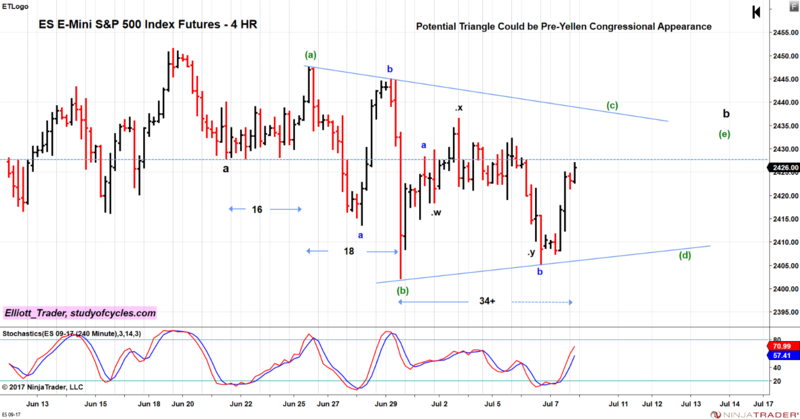 What would be more convincing of the double combination than of the triangle would be if there were a large gap up next week, that was not quickly retraced, because it is very tough to find one in the chop on the current chart. So keep your eyes on the look out. Hope this helps, and have a great rest of the weekend! Market Indexes: RUT: lower low day; SP500, ES, NQ: sideways; DOW higher. In another slow day of summer trading, the Russell 2000 continued leading to the down side with a lower low day today. The Dow continued to make higher highs as it apparently struggles to finish a contracting diagonal. A chart of that continued diagonal is below. Note that wave (iii) is still shorter than wave (i). Trend lines will be adjusted as needed. Sometimes, they like to keep these diagonals going on seemingly forever, as money tries to rotate into the perceived safety of large cap defensive names, after leaving some of the smaller and more speculative issues. The S&P500 made only an inside candle today. Whether yesterday was a first wave down or just an "A" wave down is still up for grabs. We're watching to see whether the market forms one of two upward structures, those being either a double-zigzag, upward, or a triangle. (By the settlement a triangle had not invalidated yet). If a triangle forms, it would definitely more credence to the A wave case. If the double zigzag forms then, it might lend more credence to a first wave scenario, but still the odds would be about even in that case. Again, favoring the A wave case is also the fact that the retrace has been deeper than 61.8%. The NQ futures chart, by contrast, has the makings of a flat correction, as the 90% retrace level of the three upward waves was made this morning. Here is that chart. Anyway, we note now how remarkably bullish some people are - even given the seasonal nature of declines in the August / September time frame. And, just a reminder, August is only two trading days away, with a solar eclipse in the middle of it! Well, until then, there is a fun weekend to have ahead. So, here's hoping you get a good start on it. Perhaps there will be some more over the weekend. Why Focus on Risk ? Market Outlook: S&P500, ES, NQ, and RUT likely have topped in Minor 3. DJIA might not have. Market Indexes: S&P500, DOW, ES and NQ made marginal higher highs. Not RUT. Today we got a completed count in the ES E-Mini S&P500 Futures Count that we showed from the election low in the weekend video. As required, minute wave ((v)) remained shorter than minute wave ((iii)), since minute wave ((iii)) was shorter than minute ((i)). The internal minuet waves also had the same relationship. Here is the chart as of the settle. In one four-hour bar, 39 - 40 preceding four-hour bars were exceeded lower. As of the settle, the bar had not been fully retraced. Because the prior wave (iv) was exceeded lower, and wave (i) was overlapped in the downward direction, it is possible to call a turn here, with the minor 3 wave at the top. The wedge got about as bad as a wedge could get. 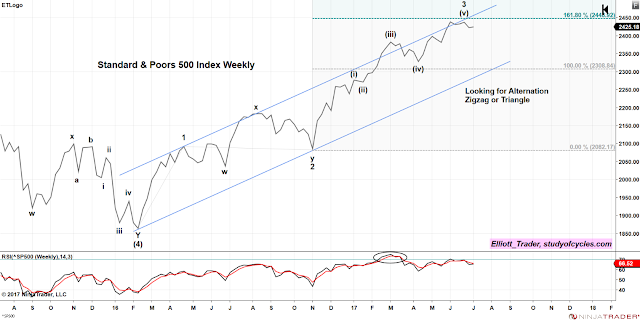 Here is the weekly chart of the E-Mini S&P500 Index, showing the likely Minor wave 3 high. Notice there is a nice resistance line from the bottoms before the Feb 2016 bottom of Intermediate (4), and those were in August and September 2015. Also note how volume has fallen off, as well. The upward wave in the E-Mini is a "trending impulse with an extended first wave", it did not form a diagonal. (We don't know the final form of the Dow, yet.) The reason we mention that is that it provides considerable flexibility in the style of downward count. It can be a zigzag or a triangle, and it could also start out with a diagonal. We've had only a relatively small wave down, given the size of other ones. It could be an A wave or a 1 wave. 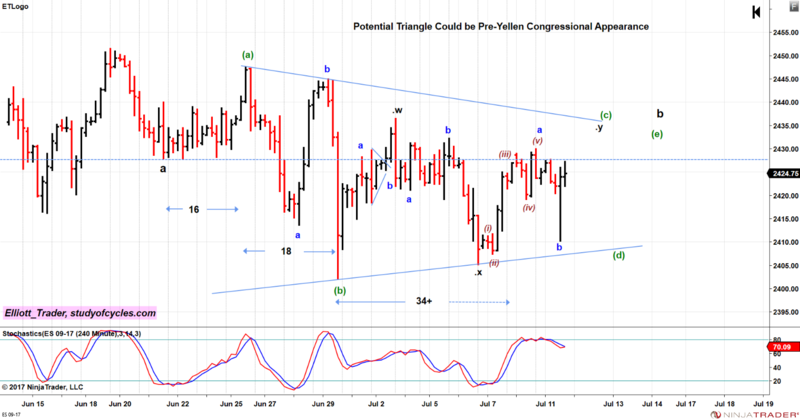 Since the upward retrace is slightly more than 61.8%, it may lean more towards an A wave down than a second wave down. Time will tell. Facebook and Amazon have all been "sold on the news" (not trading or investment advice) because of either outright earnings misses or maturation of the businesses. Have a very good start to your evening. Market Outlook: Marginal new highs still possible for major indexes. Focusing on risk instead. The U.S. Dollar Index took another leg lower on the FED's FOMC statement today and solidly broke it's prior 1.618 Fibonacci extension. The Dollar's (DX) chart is below. While there could be back-and-filling, there is not a level of double Fibonacci confluence until 92.147, and with the slow stochastic still embedded, there is 'currently' nothing bullish on the chart. A key reversal bar would be a start, but is not to be seen. With the new daily high on the DJIA, the trend lines have changed again - back to the original contracting diagonal we were counting. The new trend lines would we drawn between waves (ii) and waves (iv), if wave (iv) occurs properly. Many market commentators today noted the new low on the $VIX. However, just keep in mind the daily $VIX did have a key reversal bar today by the time the cash market closed. The key thing to keep in mind while the market continues to wedge is that most of the increase in prices is due to the Dollar, not due to solid economic growth. Be good. Be flexible and patient. And have a good start to your evening. Market Outlook: Marginal New Highs Possible in DJIA, SPX, NQ; likely not RUT; risk increases. Because trend lines matter, and a contracting ending diagonal was not adhering well to it's trend lines in the Dow Jones Industrial Average, today the pattern was converted to a triangle, below, during the live chat room. There is no alternate at this time. It is possible that this triangle will be waiting on the news from the FOMC, and a possible set of inflows from new capital on July 31 / August 1st from retirement funds, 401k's, company bonus plans, dividend reinvestment plans, etc. Although the NQ did make new all time highs today, my read on it is that - on a four-hour chart - it is just the common (B) wave of an expanded flat for it's fourth wave, as well. There are currently three waves down to (A), and three waves up to (B), and the (B) wave turned around and traded lower just before hitting the 1.382 x (A) Fibonacci ratio. Let's see how this one works out. If it does, in the short run, it will likely come back to exceed the (A) wave low, and could come back to the prior wave (4). We would adjust the channel at that time. Here again: no alternate. Well, that's it for tonight. Have a very good start to the evening. 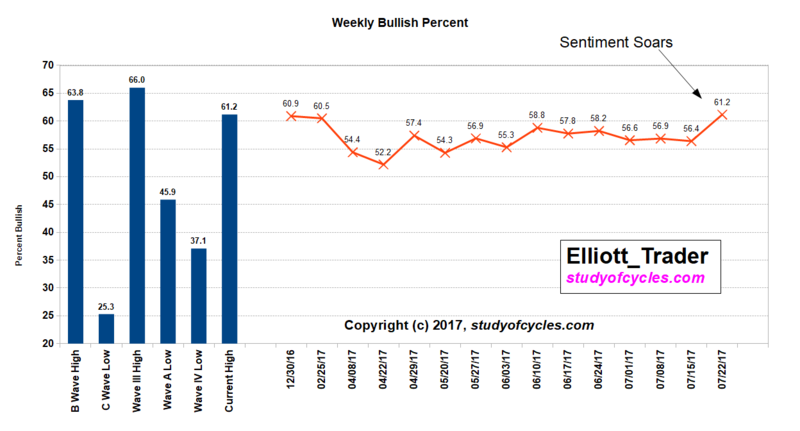 Our proprietary model of bullish sentiment across a wide range of market participants absolutely soared this week - jumping almost another five full points in one week to the highest level for all of this Primary Vth wave high. The weekly percentage of bullish investors jumped to 61.2% from 56.4 %, which is amazing of itself but it also eclipsed the prior Primary V wave high at 60.9%. For those of us that watch this on a week to week basis, recording a string of eight weeks above 55%, and then seeing this, it is amazing to watch. The biggest jump in sentiment came from the mom & pop investors who "threw in the towel" on the bearish case and whose bullishness jumped seven points in a week! But there was also a rise in bullishness among professional investors and newsletter writers, as well. Pretty remarkable. Of course, we view such one-sided sentiment as a contrary indicator in the long run, and attribute it to the power of the Minor 3 wave to sway opinion. When added to the wave counts shown yesterday, and in the weekend video, along with the low trading volumes being experienced it adds to the case for caution in upward wave counting at this time. But, there is further evidence, as well. Barron's magazine reports that Corporate insider transactions - those company officers and directors who must report transactions - are now skewed 62% to the sell side. (This is the ratio of Insider Sells to Buys). So, someone who knows something is selling at one of the fastest clips in recent history. It is interesting this occurs in conjunction with this sentiment high. Well, sentiment is good, you say, but it is price action that determines gains or losses in the equity market. Is there any price evidence of concern while the major markets are near their all time highs? To that end, we'd like to show you this chart of the Russell 2000 Index. It has a price bar not seen anywhere else on this chart - that of a "key reversal day". That is a day when prices first trade up through their all time highs - making a higher high than the previous day, then turn around and trade lower than the low of that previous day, and finally also closing lower than it, as well. This candle comes after prices may well have traded up into the triple zigzag we cited as possible in a prior post. The triple zigzag would be the minute ((b)) wave above, indicating that a steep wave ((c)) decline should begin to end the Minor wave 4. Triple zigzags are very rare birds indeed, and we wouldn't call this one except for the uncommon parallel nature of the price movement within. Price just peeked above that upper parallel, in what Elliott analysts call an "over-throw", before being smacked down back inside the channel again. Price movement down outside of the channel should well indicate that minute wave ((c)) is underway. Well. Have a good weekend. Market Outlook: Marginally higher highs possible, but risk continues to increase. Market Indexes: R2K new all time high; None of Dow, S&P nor NQ made new ATH's today. The herky-jerky action continues, but the waves continue to form properly in the ES E-Mini S&P Futures 4-hr Chart, and the Dow Jones Industrial Average. The continued loss of momentum is shown by the break of the lower ES wedge line. A new all time high is possible, but not guaranteed. (Truncation is possible). A diagonal is still not indicated in the chart above, as there are no overlaps of concern. The Dow fought a brilliant battle at it's up sloping trend line, and managed to close just above it. While point losses are minimal, the shapes of the various waves is what is troubling. However, don't let it spoil a good start to your weekend! Market Outlook: Marginal new highs still possible. Added a new potential wedge line to the ES E-Mini S&P500 Futures 4-Hr Chart, below. There's a good possibility the market will finish a fourth wave lower tomorrow which would be c of (iv) in the above chart. The Dow's count remains in a "b" wave, as below. Today's S&P500 Cash Index high was less than one full point from the 1.618 Fibonacci extension we showed in the weekend video. As Dirty Harry used to say, "are you feeling lucky, punk?" If you are, it's OK. Just watch things closely. Here is an update on the ES E-Mini S&P 500 Futures 4-Hr Chart. The upward movement broke a potential wedge shape, but in addition, still has not made a retrace of 38.2% or more. 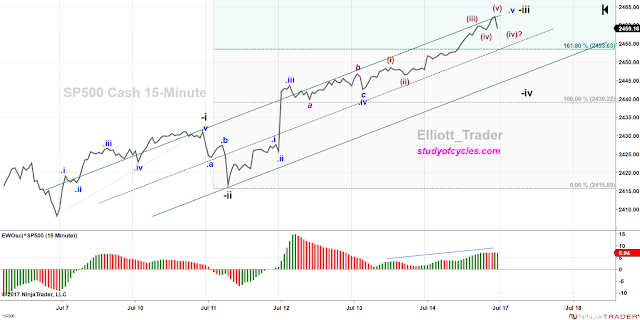 Therefore, the best count still remains an extended first wave, as below. Since we don't have a pullback of more than 38.2%, the best configuration of the count is with the extended first wave again. It might form a wedge, with a shorter wave (iii), but that remains to be seen. There is no evidence for a diagonal at this time, as there is no overlap of any significance. Tomorrow the Bank of Japan, and some Central Banks in Europe bring their monetary decisions to the fore. Let's see what prices do on those announcements. Regardless, in this scenario, wave (iii) should not become longer than wave x(i), and wave (iv), when it occurs, should be in the sharp or triangle class of waves. Here is what the Dow looks like today - not having made the new all-time high. Volume rose a bit today. But not much. Today, the Shanghai Composite completely reversed it's "ugly candle". I'm going to watch that one for an expanding diagonal now - just because the waves are so overlapping. Have a great start to the evening! Special Alert: China's Shanghai Composite (below) had an ugly candle yesterday. 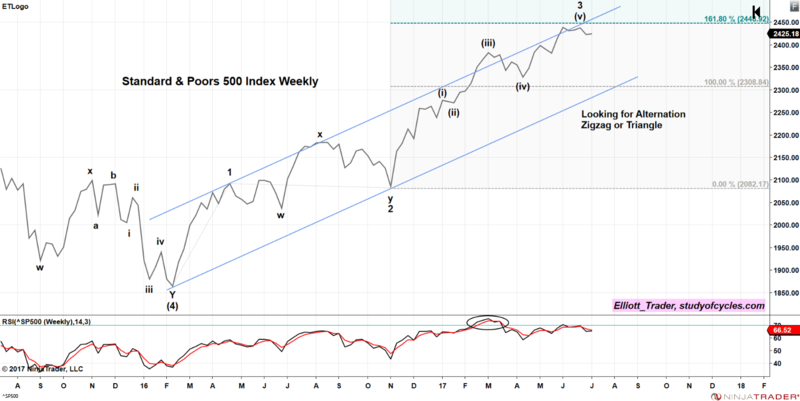 Here is an update on the Dow Jones Industrial Average converted to the same likely "extended first wave wedge" as in the weekend video (where we used the S&P500 Index for the example). We checked thoroughly, and wave minute ((iv)) does not overlap with with minute ((i)). The wedge shape is shown by the dotted blue line. This puts the waves in the same relative position as the S&P500 Index. Now, if we take a minute to look at the NQ (NASDAQ 100 futures, below). 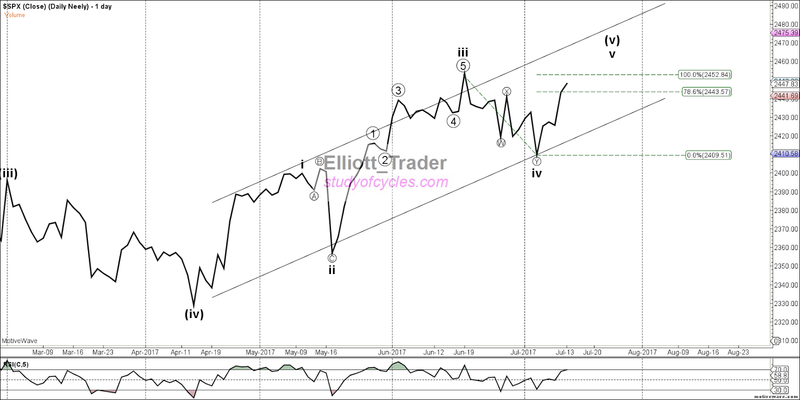 We see any new highs can be taken as potentially being in wave three of an ending diagonal. I have sketched it in for you below. Translating the above idea from the NQ futures, now to the four-hour DOW chart - rather than the three-daily DOW chart, shows a similarly possible arrangement. I have chosen to represent the potential diagonal this way, for three reasons. First, so that minuette wave (i) would be the longest wave in time inside the potential diagonal. Second, so that the c wave of minuette (i), actually makes a new closing high over the prior wave minute ((iii)) - to show it's motive character. And, third, to align as best as possible with the NQ futures. We don't know what the impetus for a turn will be. It might be domestic. It might be overseas. In that vein, I just want to provide a chart of the Shanghai Composite Index. Yesterday's candle was quite a nasty one, as below. So, tread carefully, and pay close attention - at least on a daily basis to our markets. The wedge shape has to break at some point soon! Here's an update on the ES E-Mini S&P500 Index 4-hr Chart we showed in the weekend video. We were expecting a fourth wave in the sharp class (or triangle), and that is apparently what we have gotten. Prices closed up +2.50 in the futures, but the volume was terribly low (only about 842 MM contracts) which compares to volume around the New Year's Holiday, not typical trading at all. NYSE stock exchange volume has dropped to 2.77 Bil, much lower than the 4 - 4.5 Bil which reflect more usual levels. On a different topic, the U.S. Dollar Index (DX) this morning did hit that 1.618 Fibonacci level, at 94.800, and bounced off of it. It's worth watching to see if we get that minute four correction. Well, have a very good start to your evening. Below is the video that was promised for this weekend. Please scrub about 90% of what was said on Friday's post as the further work is showing something a little different and quite promising! Let's see if it delivers. Thank you for your patronage of this blog as we attempt to deliver work that has potential for greater reliability in wave counting, fewer alternates, and fewer guesses. After reviewing this video, we hope you'll agree. Market Outlook: Slightly Higher Highs still Possible On Very Low Volume. Markets: Dow new ATH, SP500 new ATH, $RUT new closing high. I've been quite busy in the last two days updating many charts to Neely style charts. Yesterday, I showed you this daily chart, and a 15-minute chart, and said that new all time highs were possible based on my analysis of The Eight Fold Path Method. It seemed likely that a small degree (15-minute chart) wave four would begin lower. This latter portion of the prediction did not occur. The first part did. Instead, the market surge past the highs, faster than I thought, on very low volume (in the futures contracts and as volume in the cash market). We have converted the 15-minute chart now to a Neely Style Chart, and it is posted below. The two most most probable reasons for not getting the slightly larger fourth wave were 1) the presence of the "running flat" fourth wave (.iv). Two of us called that out in real time chat, yesterday, I didn't react to it adequately enough. I will try to do so in the future; and 2) the third wave had not yet made a 1.618 extension. I should easily have caught something that basic - but didn't. (Hopefully, if I miss things like that in the future that would be what I consider as excellent material for the comment section). At present, there is no confirmation that the top is in. You can see from the brown labels we are still looking to see if brown wave (iv) is looking to alternate in shape and time with brown wave (ii). The up wave passed the 1.618 extension, solidifying it as an extended third wave (-iii), which means that normal fourth wave alternation should apply. However, the Elliott Wave Oscillator is on an up trend and has 'barely' diverged at the high. Well, that's it for now. Have a good start to the weekend. I appreciate your patience as we switch to some hopefully even more effective methods. DOW: New All-time-highs, S&P: No New All-time-high yet. While nothing has occurred to invalidate the ES 4-Hr Triangle Count that we have been showing, The Eight Fold Path Method as of mid-afternoon now says something different per our discussion in live chat. First, here is that ES 4-Hr chart. It has served it's purpose. I show this chart for the last time, only so you can see that (c) is not above (a), so technically nothing invalidated. But, we now have the .y wave substantially beyond equality with the .w wave without downward overlap, and within the (c) wave, the blue c wave of (c) would be much longer than the blue a wave of (c). Since the above is true, and the upper line of the potential triangle is nearly horizontal, we started using The Eight Fold Path Method from the point labeled .x forward on an S&P500 15-minute chart. We will analyze that chart at the end of this post. Remember, we were very clear both that the former a wave up was five waves, up, and that the potential triangle had to form properly. It didn't! It doesn't have the "right look". Triangles are usually 78.6% retraces or less; this structure is 90% retraces or more. Remember from the weekend video, we said it was possible certain indexes could make slightly higher highs. That appears to be what is happening, still within Minor 3. In this case minuet iv of minute (v) probably just became longer in time that minuet ii. As a reminder, here is the weekly chart we showed in weekend video. (The daily chart from wave (iv) will follow it). So, let's start from minute (iv) on the above chart, and again use the Neely-style method to plot the daily waves - not the weekly waves - below. 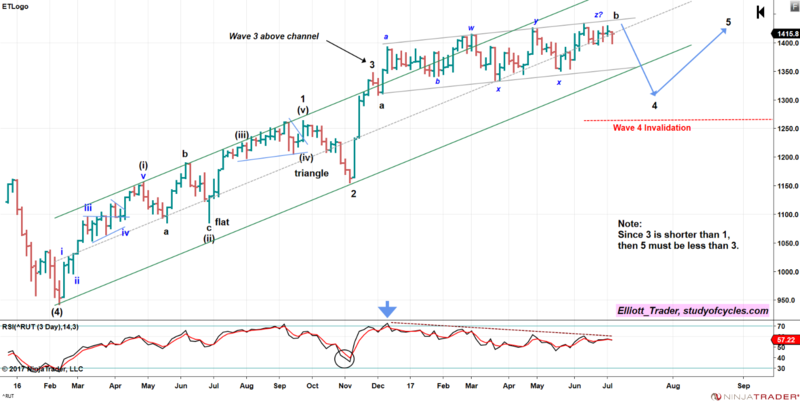 So, if we examine this chart, we see that wave ii is a FLAT wave, and wave iv is a double-zigzag which not only provides alternation, but also takes more time than wave ii! Now, we can debate for days whether wave iv overlaps wave i on an intraday basis, but it is clear it does not overlap on a daily closing basis! (See Note below). Next, wave v of (v) is already beyond the 78.6% retracement level per the Fibonacci ruler shown. That is the first level Neely says we could consider a truncation to occur. But, there is no evidence for that, yet, at this time. And so, we should consider this as the vth wave up - whether it truncates or not. So, as the result of this view, we began counting from wave minuet iv using The Eight Fold Path Method on the S&P500 15-minute chart, below. So, with 133 candles on the chart we are now counting either an impulse upward or perhaps the first three waves of a diagonal. Notice that wave (3) of ((3)) is on the maximum of the Elliott Wave Oscillator, and both wave (4)'s are longer in time than their wave (2)'s. We would now expect a wave ((4)) which is longer in time than it's wave ((2)). We would expect a fourth wave down, and as long as it doesn't overlap 2432, the prior wave ((1)) location, then we should continue to count an impulse wave. If it should overlap, then we might have to consider ((1)) and ((3)) as only ((A)) and ((C)) of a diagonal wave. But, I need to be clear, a diagonal is not in evidence, yet. As you can see, the internal waves are extraordinarily choppy - yet the Neely style plot tends to smooth out this chop quite a bit - at least on the the daily time frame. It turned out that yesterday's potential "tweezer's top" was nothing more than the B wave, up, shown. That has been happening a lot lately: the diagonal forms properly with contracting lines, and then is exceeded! And, then, when that was counted, then that B wave was exceeded higher also. Stay with it! I am considering converting all blog charts to Neely style counts - as it may help provide greater clarity on a daily basis. Thanks for listening. Note: The Elliott Wave Principle says that overlaps in the fourth wave might occur on an intraday basis only, and in highly leveraged markets. I don't know anything more leveraged than the ES E-Mini S&P500 Index futures, which impact on the S&P500. Have a good start to your evening. If you followed the market today, you know that prices took off upward today in the direction we predicted from yesterday's post. This occurred when Chair Yellen released her written testimony before Congress, and it was interpreted as marginally dovish. Prices traded higher for most of the day and appeared to make a "tweezers top" or contracting diagonal at the end of the day. We'll show you that potential "tweezers top" later on the cash chart, but first, here is the continuation of the ES E-Mini S&P Futures 4-Hr Chart. The potential triangle is still holding. Barely. At the end of the day, because we were talking yesterday about the potential double-zigzag upward for the (c) wave, then it only had to stay below the (a) wave, and, remarkably, it did. However, we must recognize the actual measurement of the upward (c) wave is > 90% of the downward (b) wave. So far, the waves have acted per prediction - which is gratifying, but the situation still looks tricky. When we transfer the above ideas to SP500 Hourly cash chart, then this is what the situation looks like - at this time. 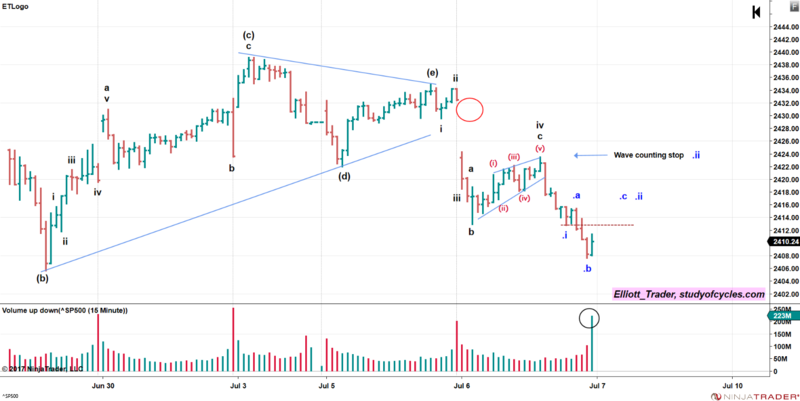 The first A wave down would be the expanding Leading Diagonal that we had commented on - on how wave (4) had just barely avoided invalidation, while the futures did invalidate. And since that time, we have only have three-wave sequences upward - to this point in time. The "deep retrace" might be the "deep retrace" of a diagonal. It is very near the high. At the end of the day you can see the "tweezers top" that may be all of or a portion of an ending diagonal. We do not know that the up wave is complete. It could be. However, in this count, the .y wave is allowed to be above the high of the .w wave, thereby avoiding a truncation. The "three-wave chop" is what seems to make the a count like this possible, but since the Dow exceeded the highs, we continue to look for other types of triangle or diagonals that would fit this pattern. We haven't found them yet. From a sentiment viewpoint - to a person the 'talking heads' on TV are still advising people to buy - again - at the highest prices in history (for the Dow). Interesting! Have a good start to the night. 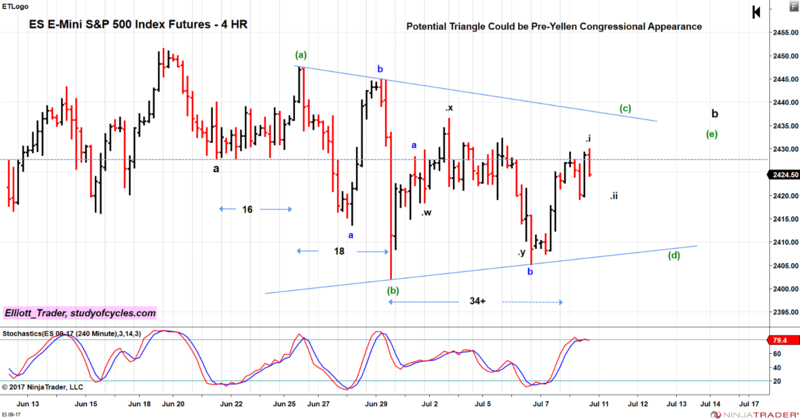 Nothing much has changed, except the single zigzag that was originally proposed for wave (c) of the triangle count now looks better as a double zigzag. The update of the ES 4-hr chart is below. We were expecting downward movement, and that initially occurred today. Then, as we said, we have been expecting whippy light volume trading, and the market did whip around again on light volume without breaking any of the triangle parameters. One leg of a triangle, and only one leg, is allowed to be a double zigzag (i.e. Elliott Wave Principle says one "complex" leg - double zigzag or triangle). We are very confident that yesterday finished "five waves up", shown in brown as (i) - (v), upward. We looked over things and recognized we may have missed a very small degree triangle on July 2 which is now shown with the blue lines. That converts the upward wave to a three wave sequence, which we have labeled as .w of (c). The downward wave into July 6th is clearly a three-wave sequence, and is then the .x wave. The five wave sequence up yesterday is a of .y of (c), and the down draft on the release of the Trump Jr. emails was a perfect 78.6% retrace for the b wave of .y of (c). And, there is still Chair Yellen's Congressional testimony to get through tomorrow and Thursday. In terms of this somewhat excruciating count, please remember that the future blue c wave of .y of (c), should it occur, can be an impulse or an ending diagonal. I have no idea which it will be, except that when it finishes, there should be no higher wave than it for quite a long time. The (e) wave, upward, of a contracting triangle should not exceed the wave (c) terminus. Further, another upward overlap of the a wave, down, on Jun 21 is required within the next couple of days. Today, Art Cashin said on CNBC, the drop in the market may have had quite a lot to do with the low volume - which is what we have repeatedly stated. If you ask me, the pro's know there is a triangle here. Let's see how it goes. Below is an update of the ES E-Mini S&P500 Futures 4-hr chart as of the settle today. The good news is we were able to count a very clean five wave impulse up in both cash and futures today, and we got the upward overlap on the a wave we were expecting in last night's post. The complexity is that we need a clean zigzag upward for either the triangle (as shown here) or a further extension of a downward diagonal. We don't have that yet. If wave .ii, .iii, .iv, and .v on this chart can form to complete the (c) wave upward, that will help clarify either of those two counts. So, that is what we expect. Perhaps wave .ii resolves tomorrow morning without making a new low below the lower blue b. If - on the other hand - prices "just let loose" tomorrow morning, for some unexpected reason, then since the downward a wave has been overlapped upward, with five waves up completed today, then we would be forced to conclude we today had the (c) wave upward of a "failure flat". Those are quite rare structures so the odds are against this option. We just point it out because running structures have happened in the upward waves of this overall Primary 5th wave. We wouldn't want it to catch you off guard. The other thing we wanted to mention was that downward a wave can be counted as a :5 in the futures, and/or a :3 in the cash market. It's just one of those ambiguous waves (not like the :5 we counted today). That's why there is still an option of a large expanding diagonal downward, if it's the :3, or a five wave a wave that comes before a triangle. So, the market kept it's options open today (no pun intended), and we did too! On Wednesday, in our blog post entitled, One Possible Interpretation, we had noted the possibility of a triangle downward in the SP500 Index. And, because of the sharpness of the triangle, we specifically said, "And it is entirely possible, the triangle could even expand a bit if it wants." Then, on Thursday we gave a specific level for a "wave counting stop" at 2424 on the S&P500 Index, as far as the downward count goes. It appeared in the SP500 15-minute cash chart. And that level was indeed hit on Friday, which put the larger down count temporarily on hold. Because since there was some support found at the 50-day moving average, and a new price low was not made in the process, the hypothesis of an triangle which is pushing out it's boundaries a bit now seems entirely plausible. Here is the chart of the ES E-Mini S&P500 Index Futures - on a four hour time frame. I highly recommend that - until further notice - this time frame be used for counting waves. The waves of the triangle are the five waves, (a), (b), (c), (d), (e) if they form properly. Please have a look at the time signature within the possible larger triangle. Each of the waves is currently becoming longer in time. Wave (a) is 16 candles, wave (b) is 18 candles, and wave (c), so far, is more than 34 candles. Furthermore, there is relatively little economic news in the beginning part of the week which could result in range-bound whippy trading until Chair Yellen begins her testimony before Congress on Wednesday. It does not end until Thursday. Waves (d) and (e) do not have to take more candles than (c). The only requirement here is that if a triangle forms properly, that waves (c) and (e) cross up and over the downward a wave from 21 Jun. If you look at where the 18-day SMA is on the daily chart, you will probably note the same thing that Ira Epstein might. "The battle is being fought at the 18-day SMA - the line in the sand". Have a good beginning to your week as it might be good to hear what Chair Yellen has to say. To say thanks for your responses to the prior blog posts, I have developed a new weekend video that appears below, and on my website, and contains several interesting topics not usually discussed. Thanks once again, and keep the ideas, thoughts, and corrections coming. I am sure we can all learn this even better than some of the supposed experts! I get a lot of requests for the Russell 2000 Count, so I have posted it below. The RUT has always had the advantage that the first wave up can be counted as a non-overlapping impulse. Within minute (i) up of Minor 1, there are five non-overlapping waves up (i - v), where iv is a clear running triangle. Minute (ii) is a flat wave, and minute (iv) is another clear running triangle to alternate with the flat wave (ii). Notice that Minor 2 occurs at the lowest reading in the RSI since the up trend began, and we think this reinforces why this is the proper location for Minor 2 in the Dow and the S&P charts, as well. Minor wave 3 then "blasts off" after the election, and breaks the channel to the upside, demonstrating it's power as a third wave. The first a wave down is "too short in time" to correct all of minor 3, and the upwardly sloping b wave is a choppy overlapping affair currently on a divergence with the RSI. When completed, this suggests that a c wave down will occur to complete Minor 4, on the same schedule as the Dow & S&P500. 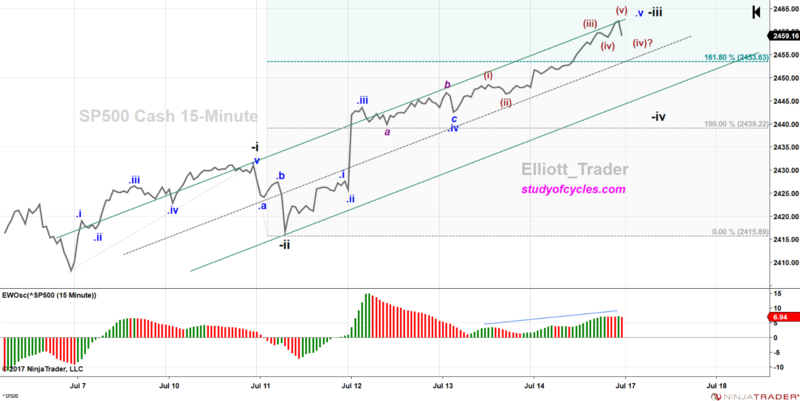 Wave minor 4 may not overlap with wave 1 before a minor 5th wave completes, upward. And, since Minor 3 is shorter in price than Minor 1, then wave Minor 5 must be shorter than Minor 3. Please note. This is not a contrived wave count. I have studied the top in excruciating detail, and because of the overlap at the blue b wave, and the lower low at x, it is not possible to have a diagonal to a higher wave 3 location. That is because diagonals are not allowed to have flat waves for any of the numbered waves (only the b waves within diagonals may be flats). Try it for yourself. I can't find a way with the current waves. Also, the entire "upwardly sloping structure" does not converge like a diagonal. It is remarkably parallel, almost perfectly parallel, and therefore it does not have the "right look". Next, the internal time signatures are not contracting like a common diagonal, again tending to rule out this option. Lastly, it is not possible to replace the 3 wave label with "a" of the first wave of a diagonal, or to replace blue a with c of (i) of a diagonal because wave 3 can not be a diagonal in it's entirety within an impulse wave. I have looked for triangles in the interior, and can spot a couple of possibilities, but, all they would do is extend the parallel in time. All of this suggests the parallel would break to the downside for minor wave 4. While we do not yet know that the upward b wave is over, it is fine for a z wave up to breach the upper trend line, and then close quickly back within it. And it is fine for the z wave to also "fail" to make a new high. But, if full daily candles begin to be printed over the upper parallel line, only then would be conclude that the last x wave, which does overlap wave 3 is somehow a second wave base for a larger advance. Such an alternate count has no evidence to support it at this time. Yesterday's idea of a triangle b wave in the hourly S&P500 Index worked out exactly as expected today. Price had closed yesterday at 2432.54, and by the open on the daily chart, there was a gap down to 2423. (See red circle). Price made a lower low than yesterday, and continued falling down to 2404.70, before closing at 2410.24, down -22.79 points. Volume picked up a bit today, as well. Here is the daily S&P 500 cash chart, updated for today's bar. The result was prices made a lower low (LL), and lower close (LC) day than yesterday, and prices made a solid close below the 10-day SMA. Still a lower low below 2405.70 is needed to confirm a down trend. The odds are it will likely happen. But, we caution, look at how many gaps there are in the wave from May 17th upward! Any or all of those could fill. We are still counting a c wave downward. Below is the chart from the live chat room on the S&P 500 15-minute chart. We called each of the waves, including the diagonal c wave of wave iv in real time. Be aware, the down wave looks incomplete at this time. While there may be some backing & filling before the low is taken out, it is possible that the fifth wave of this series is 'extending' and that could get a bit brutal. Yesterday's hourly triangle is to the left of the chart. 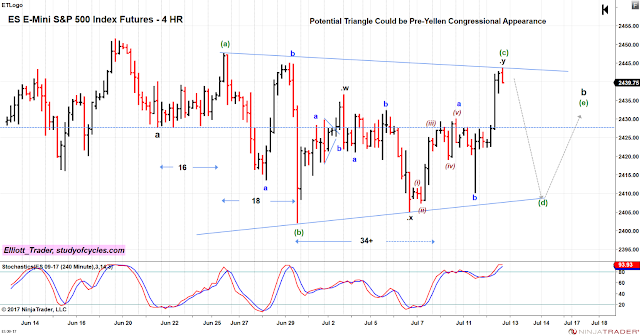 Today's downward movement has, importantly, taken out the wave ii of the a wave of (c) of the triangle. And, the level to beat is still the (b) wave of the triangle. Look how beautifully, that ending diagonal c wave of iv formed perfectly in every detail! It will not be my intention each day to show you counts from the live chat room. However, I feel it is critical at this likely turning point. But further, I want to show you examples of what a good wave count looks like. Why is this one good? Notice that within today's downward wave iv took so much longer in time that wave ii. Knowing that likely relationship gave us patience all day to wait for the b wave of the flat to be exceeded lower. Further, it was clear wave ii was a sharp wave (a zigzag), and that, again, gave us the expectation of a flat (or triangle) wave iv for alternation. If your Elliott analyst is not doing these things, then they simply are not following Elliott wave theory properly, and no matter how 'objective' they say they are being, then they simply are not. No way. We hope we at least may have helped you dodge a bullet today and over the last several days. But that is up to you. We do not provide trading or investment advice, ever. We just count waves. All decisions are your own. We hope you will tell your friends and family about this blog. If you do, it would be great to leave us a comment and let us know. Otherwise, there is not much point in publishing it. Well, have a good start to your evening. From middle June to the end of June, the S&P500 Index made a series of lower highs, and lower lows. The pattern can be clearly discerned on the daily candle chart of the S&P500 Index, below. However, so far in July - while there are lower highs - there really aren't any lower lows. Throughout this time, price has been weaving and bobbing about the 10-day SMA closing on or near it several times (green dotted line). Today is one such day. Any number of people, including myself, are scratching their heads looking for possible diagonal patterns lower, even though we know the Dow Jones Industrial Average, and the Dow Transports made a new all time high on July 1, confirming a Dow theory continuation signal in the bull market. However, today I will offer a slightly different view. The low volume, algorithmic trading, may only be a sign of a triangle, as below, on the hourly chart of the S&P500 Index. If the upward market movement had ended on 19 June, with the thrust to a C wave from the B wave triangle I had shown in previous blog posts, then, the first movements down may only be a, and triangle b, of what will initiate a c wave downward to start a larger diagonal, downward. First of all, by crossing up over the a wave, the ((E)) wave of such a triangle has already potentially validated such a "running triangle". And a running triangle would be a continuation pattern lower. What would the purpose of such a triangle be? If it plays out properly, it might be to allow the Dow and the S&P to partially synchronize again, in that the Dow may only have made it's first wave lower today, since the all time high was on July 1. Anyway, the pattern is already valid, and now it is a question of if the pattern plays out. A triangle would seem to fit with a light volume "messy" structure. And it is entirely possible, the triangle could even expand a bit if it wants. We'll have to keep an eye on it for you, as people begin to come back from their vacations, flush with cash from the lower gasoline prices. The main point is, we have lower highs on the daily chart. Lower daily lows would be needed to better validate that a down trend is underway. Have a good start to your evening - vacationing or not so lucky. EU laws require that you be informed that cookies may be placed on your computer by the blog operator (Google). The blog writer collects no information about you other than what you may voluntarily submit in order to obtain a subscription to the blog posts. If you read this blog, then you voluntarily agree to such cookie placement. If you have any questions or concerns about cookie placement, please contact the blog operator (Google). Nothing on these blog pages is intended as trading or investment advice. This site is for educational purposes only and provides information on the nature of Elliott Wave patterns that may occur in the market, as well as in history. Further, the information on these pages is not intended to recommend the purchase or sale or any securities, contracts or financial instrument of any kind. By using these pages you agree that your trading or investment decisions are your own, and you agree to hold the author and his web-sites or blogs harmless from same. You acknowledge that trading or investing is a risk activity and can cause the loss of some or all of your capital. Please consult your own financial adviser regardless of any information presented. Further, all of the information and graphics on this site are subject to the applicable copyright and are the exclusive property of Elliott_Trader. They may not be stored, re-used or re-transmitted in any way without the expressed consent of the author. Copyright (c) 2018, studyofcycles.blogspotcom. Simple theme. Powered by Blogger.